Panic! There's a pumpkin shortage and you'll never get to drink another pumpkin beer for as long as you'll live! That's what beer publication Draft reported earlier this week. To be fair, it was a little less fear-mongering than that, but we're here to tell you to calm down. There are plenty of pumpkin beers on shelves already, even though it's 90 degrees right now where I live (and probably where you live too!) -- as you can see, the "pumpkin shortage" is nothing to worry about. 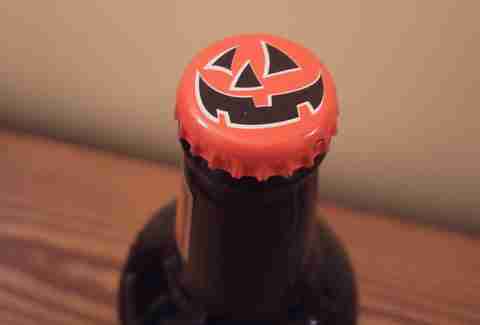 But that doesn't mean it's not annoying that we're talking about pumpkin beers in August. Let me drop a truth bomb on you: It's August. As I write this, there are 41 days left until the end of summer. 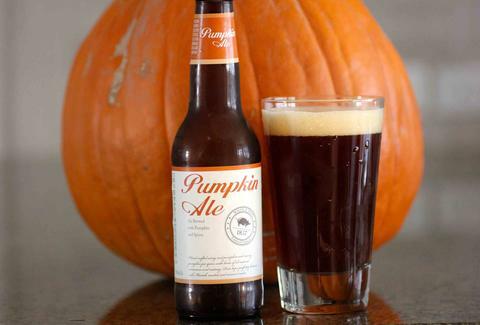 Fall is not here, and yet craft brewers are already priming us for pumpkin beer season. I spoke to a local beer shop employee and she told me it seems the breweries "are trying to beat each other to the shelves." She's not kidding. Where I live in Colorado, there's already Boulevard Funky Pumpkin, Upslope Pumpkin Ale, Jack-O Traveler Pumpkin Shandy, and Sam Adams Harvest Pumpkin Ale on shelves. As a frequent beer buyer (and drinker), I don't understand why pumpkin beers are displayed now. There's still plenty of session IPAs to drink before we get into fall beer season. Hell, I've seen pumpkin beers from last season still on shelves. So how is there a shortage of pumpkin? 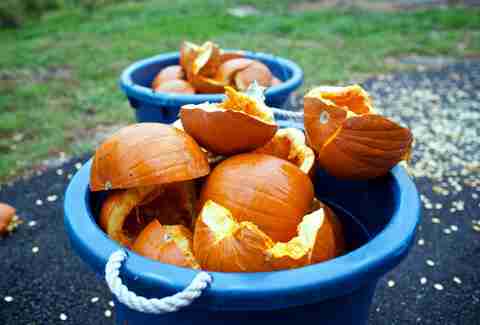 This all started when Draft reported brewers complaining of the difficulty in finding pumpkins to on a message board. Then they interviewed a few brewers who confirmed there were issues. Sounds like the makings of a shortage, right? Not exactly. We reached out to an equally small number of brewers both big and small, and have a different view. 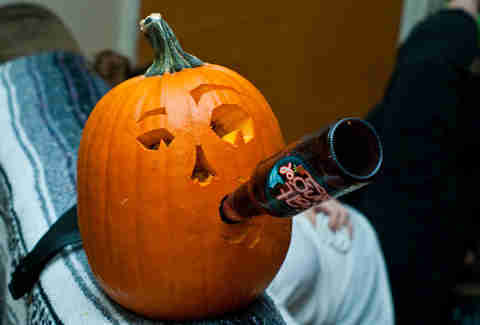 Sam Adams sources pumpkins from the Pacific Northwest and the Southeast, and had no issues. One of its brewers, Megan Parisi, told us she's brewing a beer that uses 20lbs of pumpkin in each barrel called 100 Pounds of Pumpkin. Not really, it's called 20 Pounds of Pumpkin. She had no issues. Traveler Beer Co. is a brewery that distributes its shandies nationwide, including the Jack-O Pumpkin Shandy. A rep said it was supplied plenty of pumpkins from IL, and had no problems. I also spoke to much smaller brewers, like Alan Simons of Dry Dock Brewing, which only distributes in CO, and he said he did have a problem finding pumpkin puree for his Imperial Pumpkin Ale. Ah crap, I was wrong this whole time! There is a shortage! Panic! Panic! Just kidding -- even though Dry Dock had issues sourcing the beer, it partnered with Ticklebelly, a bakery across the street to get some more pumpkin puree. Apparently the bakery had problems finding some too! But Simons worked with the Ticklebelly folks and ultimately he was able to get enough puree to make the beer. Hooray! Sure, there might be some supply chain issues in sourcing pumpkins, but until the day comes when you go to a taproom or the liquor store and can't find pumpkin beer -- it's not a shortage. There's a ton of them out now, and IT'S FLIPPING AUGUST. I love pumpkin beers -- hell, I tasted a ton of them for science -- but I'd be fine to not see another one between now and October. Once it hits fall, I know the shelves will be packed with everyone's favorite gourd beer, and I'll be drinking along with everyone else. But for now? Let's all stop panicking about made-up shortages and enjoy another fruity session IPA while we still can. Lee Breslouer is a senior writer for Thrillist, and could do without pumpkin flavored things until the fall. Follow him to nutmeg: @LeeBreslouer.